Precision Glass & Optics (PG&O), an expert in optical manufacturing for 25 years, offers advanced thin film coatings, commercial optics, and precision optics (standard and customized) for military and defense applications. 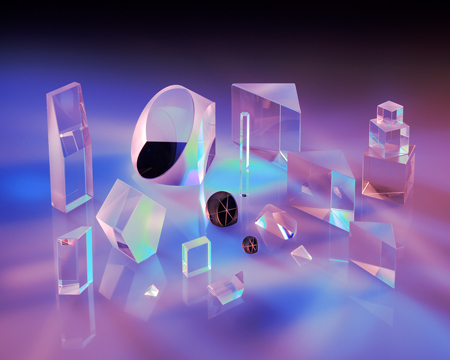 The in-house facility specializes in plano optical components, from prisms to windows, beamsplitters, light pipes, optical mirrors and retro-reflectors. PG&O can quickly provide a large variety of glass and thin film coated optical materials, from square, rectangular and/or circular parts. Optics can be customized to exact specifications or shipped from in-stock items, within a 48-hour turn around, for time-critical projects. Fabrication services include the new abrasive waterjet technology, laser engraving, annealing, CNC machining, drilling, double-sided grinding and polishing, diamond bandsawing, slicing, scribing, and more. PG&O’s polishing capabilities (up to 36”Ø) typically achieves flatnesses to ?/20, parallelism to 1 arc second, and tolerances to ±.0005”. Thermal and chemical tempering is also available to meet the most demanding part-strengthening requirements. Optical thin film coating capabilities include a chamber that enables coatings up to four, 24”Ø substrates. Implementing the fundamentals of MIL-I-45208A as well as the optical manufacturing disciplines of MIL-PRF-13830B, the company’s glass, optics, and thin film coating services are ideal for a wide variety of military and defense tasks. Other precision optical areas of application include biomedical, solar, imaging, scanning, digital cinema, and laser manufacturing.